Providing plenty of variation on the distortion/drive theme, a pedal with two engines at this price is a steal. 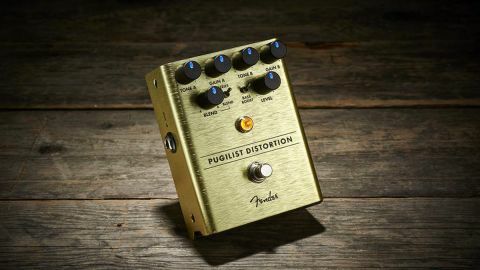 Because it’s called the Pugilist you might expect it to deliver brutal distortion, but while it can definitely do that there’s a subtler side to this pedal. What it offers are dual gain engines (A and B) linked to a Blend knob so you can have 100 percent A or B or a mix of both. This is a brilliant feature as there’s a wide variation of tone available from blending the two channels especially as each has its own adjustable Gain and Tone. Channel A offers a slightly milder distortion than B so you can use a touch of A with brightened tone to add clarity and pick attack to the saturated sound of B or have a mixture of both reminiscent of playing through two amps. You can also choose to run the two engines in series where full-on high-gain sound with rich harmonics is pretty much guaranteed. The Pugilist is also capable of raunchy overdrive at lower levels of gain.